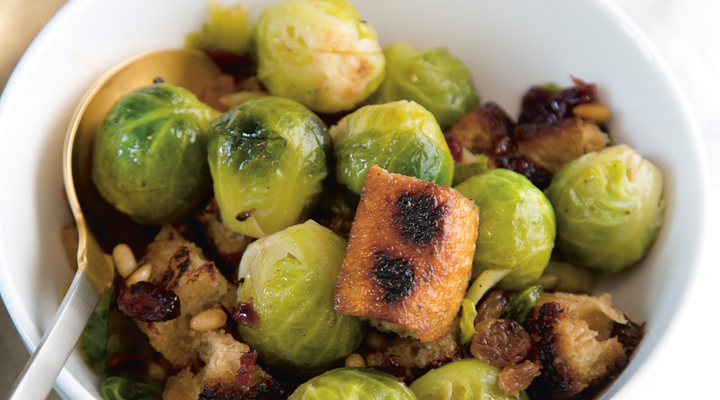 Tasty Tip: Add some streaky bacon to bring an extra layer of flavour to the Brussels sprouts. Meanwhile, heat the olive oil and half of the butter in a very large, heavy, non-stick frying pan set over a low heat. Add the bread, pine nuts and thyme and cook for 1 or 2 minutes, shaking the pan frequently to colour and caramelise the bread and pine nuts. Season with salt and pepper. Remove the mixture from the pan to a small bowl and add the sultanas and dried cranberries. Return the pan to a high heat and add the Brussels sprouts. Fry for 3 to 5 minutes, until slightly coloured. Season with salt and pepper and add the remaining butter. Stir in the bread mixture and briefly toss to combine. Transfer the Brussels sprouts to a platter and serve immediately.